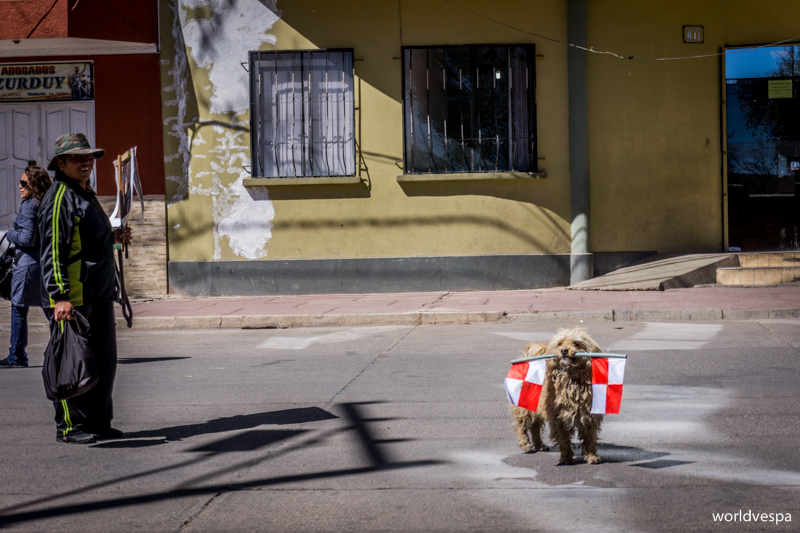 The decision to leave from the Salar de Uyuni wasn’t that easy. We loved being in such a unique place and when we finally left, it was already afternoon – let alone we had to wash the vespa thoroughly! After 2 days of driving on pure salt, it would be very likely to get a bit more rusty than the normally acceptable! We headed towards Potosi and the plan was to stop somewhere on the road and pitch our tent before the night falls. The next morning we would continue our trip and we would try to enter the city which was blocked by strikers. We finally camped outside the village Pulacayo. We followed a dirt road and found a spot where we would be out of sight from the main road. After having pitched our tent, we realized that the place we chose to spend the night was the landfill of the village! Due to the low temperatures and to the fact that the landfill seemed newly dug, the spot was cleaner than many other spots we have pitched our tent (even cleaner than some “organized” campsites). Several kilometers before we got to Potosi, the traces from the clashes of the previous days were more than obvious. There were stones scattered on the road and – especially near villages, we could see burnt materials, such as tyres, pieces of wood etc. However, the most important clue was that we were the only ones driving a vehicle on a completely empty road! 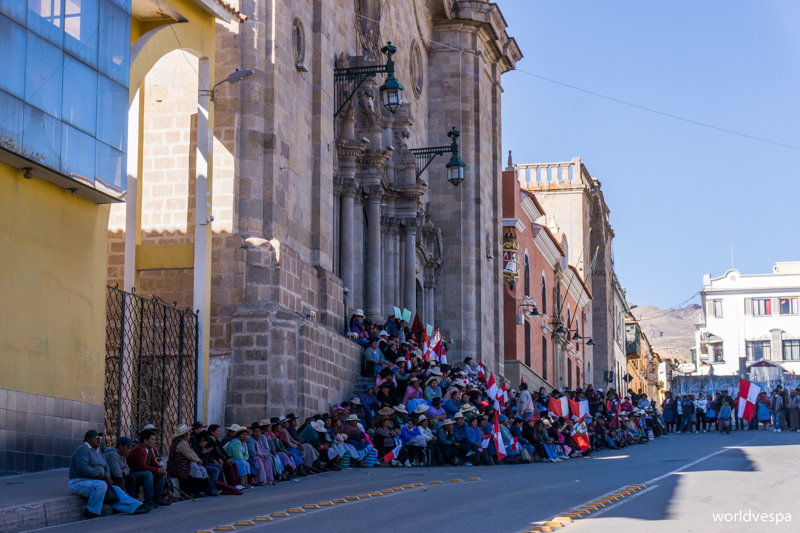 We had heard on the radio that the region of Potosi wasn’t safe and that the clashes were violent, but we didn’t believe that we would be in actual danger. We had decided to stop and talk with the strikers on the roadblocks and of course, respect what they would tell us. We got at the tolls few kilometers from the city. The toll-bars were wide open and we stopped at the booth to ask if we could pass. The strikers, after asking our nationality, gave us permission to continue. After the toll, the stones and burnt pieces on the road were everywhere around us and when we got to the entrance of the city, a bus was parked vertically blocking the way forcing us to make a maneuver in order to cross and stop 5 meters away, ready to talk with some tens of strikers who were looking towards us with an expression of astonishment on their faces. They seemed alert but not at all aggressive or threatening…Mass Media exaggerations, as usual! We got off the vespa and the conversation begun. We asked them about the strike, their demands, the situation. They asked us about Greece, the crisis, the journey. 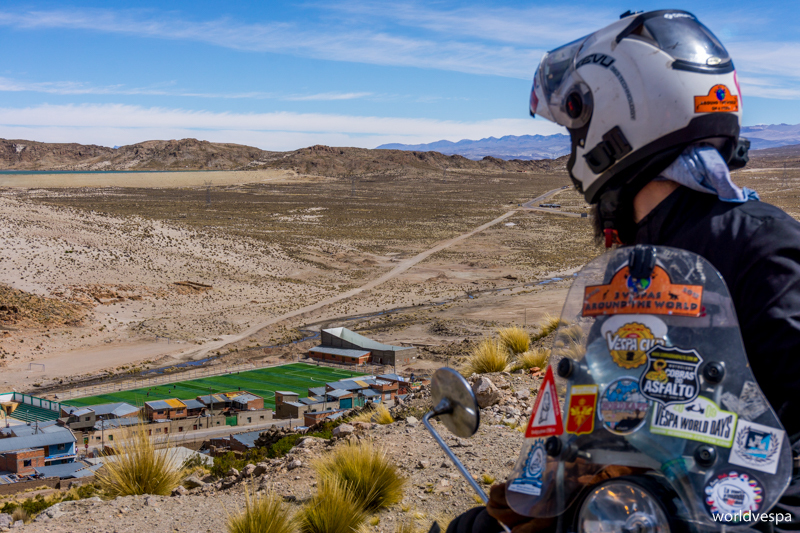 They laughed a lot when we explained them that we needed two days to get from Uyuni to Potosi. A little later, we were climbing up to Potosi. The strikers – the majority of them, miners – had reassured us that we can go on to the city with no worries. The things were a bit difficult for the vespa. 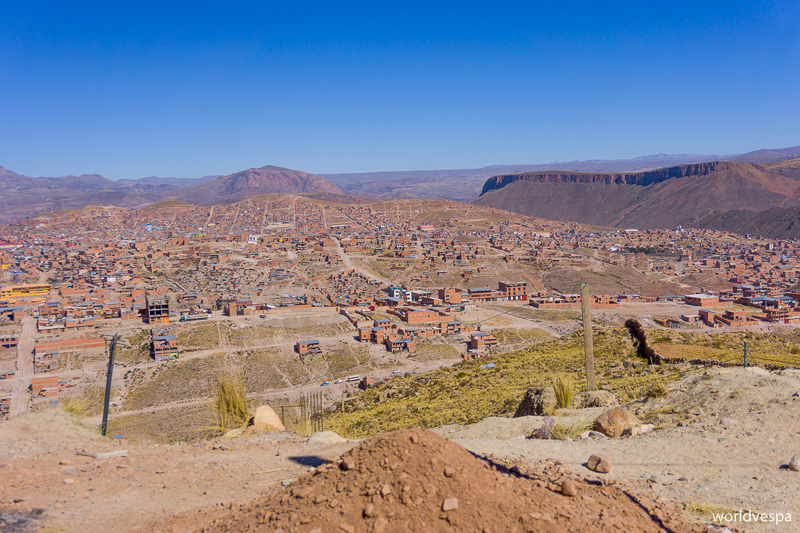 Potosi is built on mountain slopes and the rocks and roadblocks we had to cross through, didn’t give us many options: the clutch had a suspicious burning smell and…I had to walk! We started roaming in the streets and tried to find clues that would tell us that there were people who disagree with the strike and continue working normally. We didn’t find any. We found a place to stay but the owner wasn’t against the strike, he just wanted to help us. So, we concluded that the vast majority of the people of Potosi were supporting this fight. Soon, we learned about the working hours of the shops: they stayed open for about 2 hours per day, only to supply the people with the basics. Some street vendors would also appear during the afternoon and that was it. No restaurants, no cafeterias, nothing. We were glad to have met Potosi under these “abnormal” circumstances. 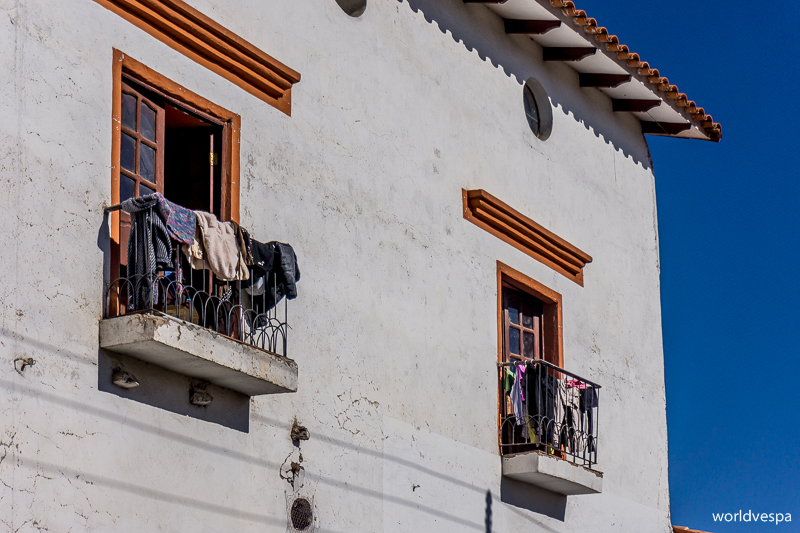 We had the opportunity to learn more about life in Bolivia and especially, we had information directly from the source and not from the Mass Media and their dramatic descriptions! Literally EVERYBODY on strike / Όταν λέμε πως όλοι απεργούσαν, εννοούμε ΟΛΟΙ! After 4 days in Potosi, it was time to go on. First, we had to find petrol. Βy coincidence, we met a kind man who took some out of his own motorcycle and gave it to us. It would be enough for many kilometers and he reassured us that we could find petrol when we would leave the Potosi region. However, the real adventure started when we reached the main exit of the city. Of course, there was another roadblock there, but this time the strikers on guard were women. Α “sturdy” middle aged woman, traditionally dressed with her huge colored skirt and her two long braids, came towards us threatening to hit us with a wooden stick! The moment we saw her, we stopped and tried to explain her that we had the permission to be in the city and that otherwise, it would impossible to be there. Probably, the angry lady was also a bit confused…The orders were clear: nobody would pass! However, the detail she hadn’t caught was that nobody would cross TOWARDS Potosi, not OUT OF Potosi. Finally, a young woman who also wanted to practice her English a bit, came and helped us. The big lady decided that we could continue but probably, in a last attempt to scare us she warned us that on the next roadblock, the stikers (who were miners) would try to hit us and pinch our tires! The funny thing was that not only didn’t the miners threaten us, but on the contrary, they helped us cross a small mountain of dirt and stones which was the main roadblock and they were happy to talk and make jokes! We were the only foreigners they had seen for a long time and they probably wanted to have a small chat with others than their colleagues. From that day and on, the only thing that frightened me in Bolivia were the big ladies with the long braids…and not with no reason! 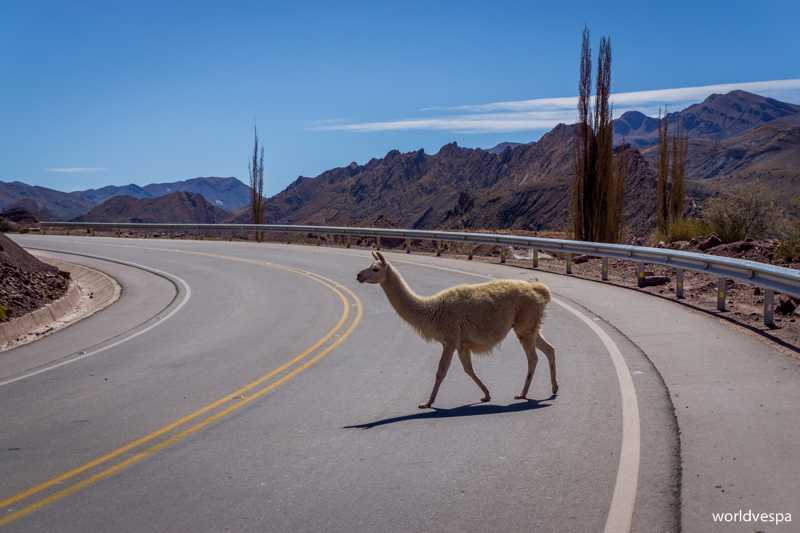 The element of surprise was present during our whole stay in Bolivia. However, nothing could prepare us for the adventure of “petrol purchase”! Due to the strike which held on for about a month, the petrol pumps had dried out and the same thing was about to happen to the vespa, too! In some parts of the route where the road was going down, Stergios had to do the old trick “turn-off-the-engine-and-just-let-it-roll”. The first petrol station which was open was more of an oasis to our eyes – until I got there holding the jerrycan…There, I heard for the first time the phrase that I would be tired to hear in the future: “Sorry, we can’t sell you petrol!”. 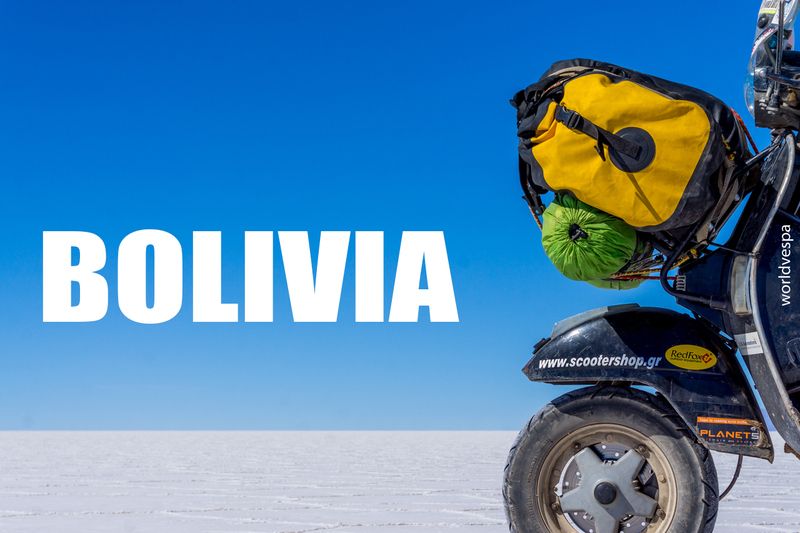 According to the law, fuel is sold at a low price in Bolivia, though only to the locals. The foreigners, should pay three times more than the locals – but, this is not the only problem. There are only few petrol stations allowed to sell to foreigners (holding the legal documents – permit), so in most cases we had to make an “illegal” purchase. This means that if you don’t want to pay 1.30euro for something you can buy for 0.40euro, you have either to beg with a huge naive smile or to agree with a local to buy the fuel for you. In any case, you should never go to the petrol station with your vehicle, but park it somewhere where it’s not visible and take your jerrycan with you. In some places where they insisted to sell us at the “international” price, we demanded a receipt, but they were not happy to give us one. We are not sure if this system really helps the local economy or produces other types of problems. Until our last day in Bolivia, purchasing fuel was the only really annoying thing we had to cope with. 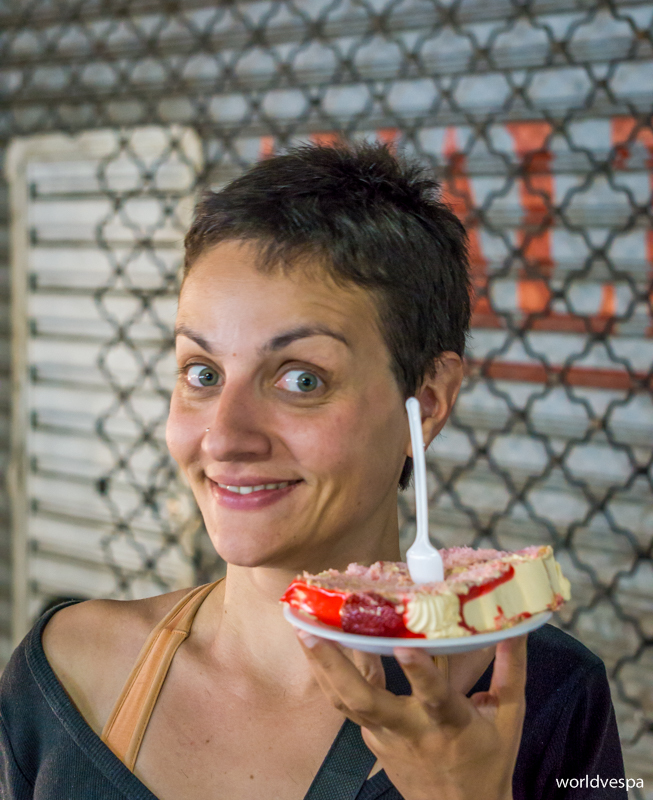 In order to buy enough petrol to get to Sucre, I used the “smiling and begging” trick which went well! The polite young woman at the petrol station hid behind the pump and filled the jerrycan at the local price. Soon, we were in Sucre. 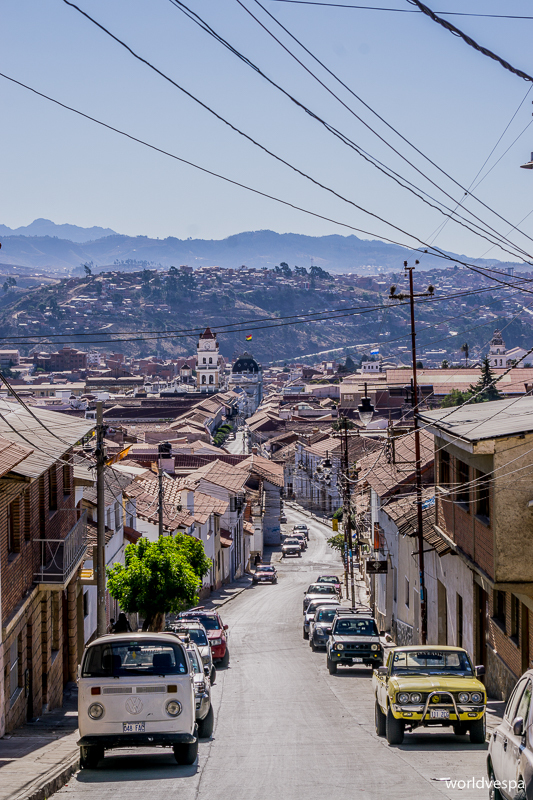 This city was completely different from Potosi – I’m talking about the city center, because in almost every city we saw, the poorer suburbs were very similar to each other. The historical buildings were made of stone and the colonial architecture was prevailing in most of the areas around the historical center. We found a nice hostel to stay and we decided to spend some time to see Sucre. The first thing to do was to go to the customs office and extend the temporal permit of the vespa. Everything went surprisingly well: we renewed the permit with no problems or suspicious extra charges. However, when we left from the hostel to go to the customs, the exhaust of the vespa accidentally hit and broke a small piece of the cement joint at the edge of one step. The lady in charge – a big lady with long braids – got angry and tried to scare us telling us that she had to call for a technician to fix it and that it would cost a lot! We took full responsibility of the broken step but we wouldn’t agree to pay a fortune for such a minor damage! She couldn’t believe her ears when with a wide smile on our faces, we reassured her that we would fix it on the same day! When we got back to the hostel, we had already bought the materials to fix the step (and if we wanted, we could fix about 10 more broken steps in the hostel…). In less than half an hour, it was like new and the lady had a smile of disappointment, having realized that she didn’t have any excuse to get extra money from the “gringos”. I have to admit another thing, though! 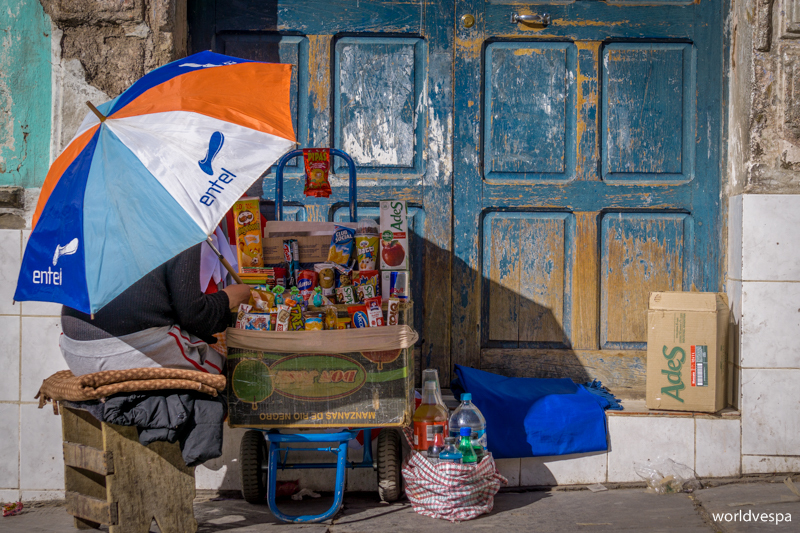 Our everyday walks to the market were not only with the purpose of taking pictures. On the first floor of the building, there was the “prepared-food” section. 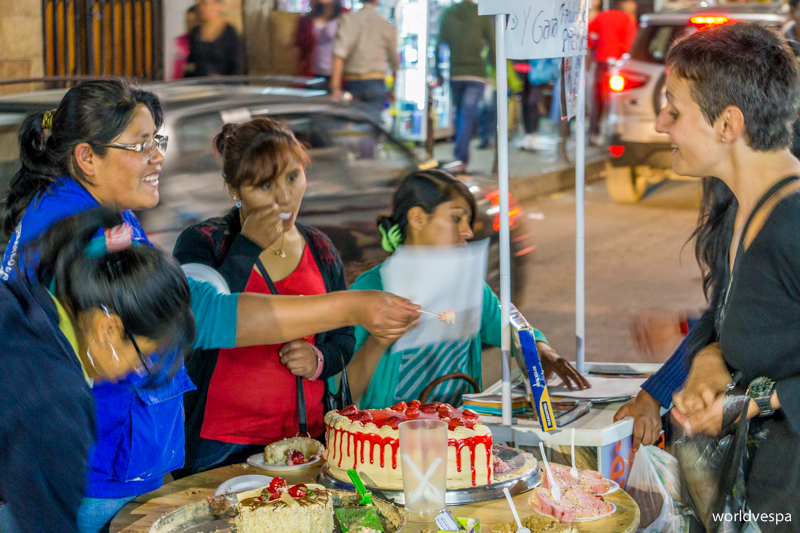 The sign wrote “Comida Tradicional” – traditional cuisine and there were women cooking and serving all types of typical Bolivian recipes! Tasty, freshly-cooked cheap food in large portions: ideal for us! Meatballs, sausages, spicy chicken or meat, soups, salads…and I repeat: with not even the slightest food poisoning! 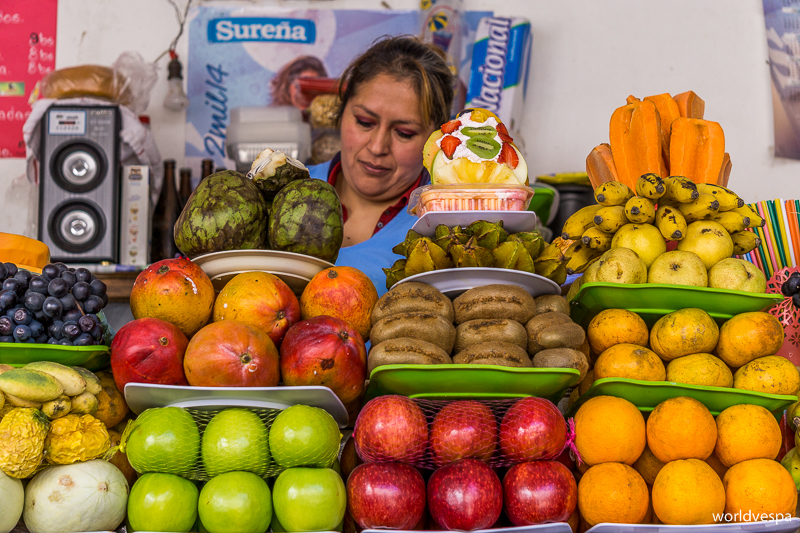 The best part came after lunch: On the ground-floor patio, there was the “juice and fruit salad section”…the best in Bolivia! Tens of women were selling freshly squeezed juices or fruit salads with crème-fraiche and yoghurt. With fruits like “chirimoya”, “maracuya”, “carambola” etc, every fruit salad we ate was a pleasant experience! Birthday cake! / Τούρτα γενεθλίων! Μέχρι να πάρουμε την τελική απόφαση και ν’ αφήσουμε πίσω μας το απόκοσμο τοπίο της Salar de Uyuni, είχε ήδη μεσημεριάσει. Στην καθυστερημένη μας αναχώρηση έπαιξε ρόλο και το γεγονός πως μετά από δυο μέρες που οι ροδίτσες της βέσπας κυλούσαν σε αλάτι, χρειαζόταν λίγο πλύσιμο ώστε να μη σκουριάσει τελείως! Είπαμε λοιπόν, να ξεκινήσουμε για το Ποτοσί και πριν νυχτώσει να βρούμε κάποιο μέρος να διανυκτερεύσουμε, ώστε να φτάσουμε στον προορισμό μας την επόμενη μέρα χωρίς βιασύνες. Αυτό το μέρος βρέθηκε κοντά στο χωριό Pulacayo. Ακολουθήσαμε έναν χωματόδρομο και βρεθήκαμε σ’ ένα σχετικά απομακρυσμένο μέρος όπου αποφασίσαμε να στήσουμε τη σκηνή. Τη στιγμή που η σκηνή ήταν έτοιμη και η συζήτηση είχε στραφεί προς το μενού της μέρας, κάναμε μια όχι τόσο ευχάριστη διαπίστωση: το μέρος που επιλέξαμε ήταν η χωματερή του χωριού! Δε νομίζω να υπάρχει άλλη τόσο καθαρή χωματερή! Προφανώς ήταν καινούρια γιατί ο λάκκος που βρισκόταν κάποια μέτρα μακριά μας ήταν σχεδόν άδειος και το τοπίο δε φαινόταν καθόλου “ανθυγιεινό”. Άλλωστε, η θερμοκρασία ήταν τόσο χαμηλή που δε θα επέτρεπε σε πολλά μικρόβια να επιβιώσουν εκεί πάνω. Ελεύθερο κάμπινγκ σε χωματερή λοιπόν! Η διαδρομή προς το Ποτοσί την επόμενη μέρα ήταν πολύ όμορφη. Το τοπίο εξακολουθούσε να είναι άνυδρο και το υψόμετρο πολύ υψηλό κι αυτός ο συνδυασμός ήταν ο ιδανικός για να φυτρώνουν διάφοροι κάκτοι κι άγνωστα σ’ εμάς δέντρα, καθώς επίσης και για να βόσκουν πολυάριθμα λάμα. Όσα λάμα κι αν συναντήσαμε στο δρόμο δε βαρεθήκαμε να τα φωτογραφίζουμε, αφού η κωμική τους όψη σε κάθε περίπτωση μας διασκέδαζε (Εντάξει, παραδέχομαι πως φάγαμε κάμποσα στο πέρασμά μας από τη Βολιβία, αλλά ήταν νόστιμα τα άτιμα!). Αρκετά χιλιόμετρα πριν φτάσουμε στην πόλη του Ποτοσί, φάνηκε πως η περιοχή βρισκόταν σε αναβρασμό. Ο δρόμος σε πολλά σημεία ήταν “πασπαλισμένος” με πέτρες διαφόρων μεγεθών και πάνω στην άσφαλτο, κυρίως κοντά σε οικισμούς, υπήρχαν αποκαΐδια. Το βασικότερο στοιχείο όμως, ήταν πως στο δρόμο ήμαστε ολομόναχοι. Κανένα άλλο όχημα δεν περνούσε. Είχαμε ακούσει στο ραδιόφωνο πως η περιοχή δεν ήταν ασφαλής και πως βίαιες συγκρούσεις είχαν προηγηθεί τις τελευταίες 3 περίπου εβδομάδες. Δεν πιστεύαμε ωστόσο πως θα κινδυνεύαμε, αν προσπαθούσαμε να περάσουμε σεβόμενοι τους ανθρώπους και τον αγώνα τους. Τα διόδια πριν την πόλη ήταν ανοιχτά και στο κουβούκλιο υπήρχαν μερικοί απεργοί που, αφού μας ρώτησαν την εθνικότητά μας, μας άφησαν να συνεχίσουμε. Τώρα πια, οι πέτρες και τα διάφορα εμπόδια στον δρόμο είχαν πληθύνει και σε λίγα χιλιόμετρα ο δρόμος έκλεισε τελείως από ένα λεωφορείο που ήταν παρκαρισμένο κάθετα στα δυο ρεύματα κυκλοφορίας. Κάναμε έναν μικρό ελιγμό, το προσπεράσαμε κι αμέσως μετά σταματήσαμε για να μιλήσουμε με τους απεργούς που ήταν μαζεμένοι εκεί. Είχαμε διαβάσει για το πολύβουο και χρωματιστό Ποτοσί, με το έντονο χρώμα και την παραδοσιακή αγορά του, με τη χαοτική κίνηση στους δρόμους και τις εκατοντάδες μικροπωλητών. Η εικόνα που αντικρίσαμε εμείς, ήταν τελείως διαφορετική. Στους δρόμους δεν υπήρχε ούτε ένα όχημα, τα καταστήματα ήταν ολόκλειστα και μόνο πεζοί περπατούσαν στα πιο κεντρικά σημεία της πόλης. Ολόκληρη η πόλη απεργούσε! Κάναμε μια βόλτα στην πόλη ψάχνοντας κατάλυμα και μας έκανε εντύπωση πως ακόμη και κάποιοι ξενώνες αρνήθηκαν ευγενικά να μας εξυπηρετήσουν, εξηγώντας μας πως απεργούν. Σύντομα βρήκαμε ένα δωμάτιο και ξεκινήσαμε να γνωρίσουμε την πόλη υπό αυτές τις “ειδικές” συνθήκες. Πιο μαζική κινητοποίηση πολιτών δεν είχαμε ξανασυναντήσει. Οι δημόσιες υπηρεσίες ερμητικά κλειστές. Οι ιδιωτικές επιχειρήσεις, το ίδιο. Σχολεία, πανεπιστήμια…όλα κλειδαμπαρωμένα και οι κάτοικοι στους δρόμους σε συνεχείς συνελεύσεις! Ζητούσαν τριτοβάθμια φροντίδα υγείας για το νοσοκομείο της πόλης, κατασκευή διεθνούς αεροδρομίου και οργάνωση τσιμεντοβιομηχανίας στην περιοχή. Υποσχέσεις που είχαν λάβει τα τελευταία χρόνια. Χωρίς ωστόσο να πραγματοποιηθούν. Περιπλανηθήκαμε στους βρώμικους δρόμους της πόλης και προσπαθήσαμε να βρούμε τα σημάδια εκείνα που θα έδειχναν πως κάποιοι κάτοικοι διαφωνούν, πως αντιδρούν με όποιον τρόπο στις κινητοποιήσεις. Δε συναντήσαμε κάτι τέτοιο, ή τελοσπάντων, ήταν μια μειοψηφία που εμείς δεν καταφέραμε να συναντήσουμε. Σύντομα, συντονιστήκαμε με το απεργιακό πρόγραμμα καταστημάτων: 11.00-13.00 ήταν ανοιχτή η αγορά για να μπορεί κανείς να προμηθευτεί κάποια τρόφιμα και το απόγευμα, στους κεντρικούς δρόμους της πόλης μερικές γυναίκες πουλούσαν κάποια βασικά αγαθά – κυρίως λαχανικά, ψωμί και τυρί. Εστιατόρια, καφετέριες και κάθε τέτοιου τύπου καταστήματα: κλειδωμένα. Χαρήκαμε πολύ που γνωρίσαμε την πόλη του Ποτοσί υπό τέτοιες συνθήκες και που καταφέραμε να έχουμε μια εικόνα που κανένα μέσο δεν έδειχνε. Η οργή του κόσμου υπήρχε, αλλά όχι αναίτια κι όχι προς τον οποιονδήποτε. Οι βίαιες αντιδράσεις – που υπήρχαν – στόχευαν προς την αστυνομική καταστολή και τους τοπικούς άρχοντες. Μετά από τέσσερεις μέρες στο Ποτοσί, αποφασίσαμε να συνεχίσουμε. Ρωτώντας πού θα βρούμε βενζίνη, γνωρίσαμε έναν ευγενέστατο άνθρωπο που έβγαλε απ’ τη δική του μοτοσυκλέτα και μας έδωσε το δυσεύρετο, εκείνο το διάστημα, καύσιμο! Η περιπέτεια ξεκίνησε στην έξοδο της πόλης, όπου υπεύθυνες για την κίνηση στο δρόμο ήταν οι γυναίκες κάτοικοι. Μια αρκετά εύσωμη κυρία μέσης ηλικίας με την παραδοσιακή της φορεσιά και τις μακριές της πλεξούδες, μας έφραξε αγριεμένη το δρόμο, κραδαίνοντας ένα μπαστούνι κι απειλώντας πως θα μας χτυπήσει! Φυσικά σταματήσαμε και προσπαθήσαμε να της εξηγήσουμε πως σαφώς και πήραμε άδεια για να μπούμε στην πόλη από τους απεργούς που βρίσκονταν στην είσοδο και πως ούτως ή άλλως είναι αδύνατο να μπει κανείς στο Ποτοσί χωρίς να σταματήσει στα οδοφράγματα. Η αγριεμένη κυρία, ήταν και κάπως μπερδεμένη…οι εντολές ήταν σαφείς: να μην περάσει κανείς! Αυτό που μάλλον δεν είχε καταλάβει καλά, ήταν πως δεν έπρεπε να περάσει κανείς ΠΡΟΣ την πόλη κι όχι ΑΠΟ την πόλη! Τελικά, με την αρωγή μιας νεαρής κοπέλας, που ήθελε να εξασκήσει και λίγο τα αγγλικά της προς τους τουρίστες, η αγριεμένη κυρία μας άφησε, προειδοποιώντας μας όμως για τους αμείλικτους απεργούς μεταλλωρύχους που θα μας χτυπούσαν και θα μας έσκαγαν τα λάστιχα 5 χιλιόμετρα πιο κάτω! Το αστείο της υπόθεσης ήταν πως όχι μόνο δε μας απείλησαν οι μεταλλωρύχοι, αλλά μας βοήθησαν να περάσουμε κι από ένα ψηλό χωμάτινο οδόφραγμα! Όλοι χαμογελαστοί, με ενδιαφέρον να μας πουν για τον αγώνα τους. Ήμασταν άλλωστε μάλλον οι μοναδικοί ξένοι που πέρασαν εκείνο το μήνα από την πόλη, οπότε ίσως οι άνθρωποι να ενδιαφέρονταν να μιλήσουν σε κάποιον που να μην ήταν δημοσιογράφος ή απεσταλμένος κάποιου φορέα. Από εκείνη τη μέρα και μετά, το μόνο που με φόβιζε στη Βολιβία ήταν οι εύσωμες μεσήλικες κυρίες με τις μακριές πλεξούδες…κι όχι πάντα άδικα! Με λίγα παρακάλια κι εξηγήσεις πως δεν έχουμε σταγόνα και πως δε θα καταφέρουμε να φτάσουμε στο Σούκρε, η ευγενική υπάλληλος ¨κρύφτηκε” πίσω απ’ την αντλία με το μπιτόνι και μου το έφερε πίσω γεμάτο – ευτυχώς χρεώνοντας με τη χαμηλή τιμή. Σύντομα μπήκαμε στο Σούκρε λοιπόν! Η πόλη αυτή ήταν τελείως διαφορετική από το Ποτοσί – μιλώ πάντα για το κέντρο, γιατί τα φτωχά προάστια ήταν σχεδόν παντού παρόμοια. Τα κτήρια του κέντρου ήταν πέτρινα, λευκά και η αποικιοκρατική αρχιτεκτονική ήταν κυρίαρχη. Βρήκαμε έναν όμορφο ξενώνα κι αποφασίσαμε να περάσουμε λίγες μέρες εκεί. Πρώτο μας μέλημα ήταν να βρούμε την υπηρεσία του τελωνίου και να επεκτείνουμε την άδεια κυκλοφορίας της βέσπας. Στην υπηρεσία όλα πήγαν καλά, χωρίς εκπλήξεις και μυστηριώδεις χρεώσεις, όμως φεύγοντας απ’ τον ξενώνα το πρωί, η βέσπα ανεβαίνοντας ένα σκαλάκι το κοπάνησε ελαφρώς κι έσπασε ένα κομμάτι απ’ τον αρμό στη γωνία του. Η υπάλληλος του ξενώνα (εύσωμη Βολιβιανή με παραδοσιακές πλεξούδες), αγριεμένη μας είπε πως θα έπρεπε να καλέσει εργάτη και να πληρώσει ακριβά τη ζημιά…Αμ δε! Με μια γρήγορη ματιά, είδα πως στα περισσότερα σκαλάκια του κτηρίου υπήρχαν σπασίματα και μάλλον η κυρία ήθελε να μας τρομάξει ή να μας χρεώσει έξτρα – εντάξει, δικό μας το λάθος και θα το διορθώναμε, αλλά όχι κι ολόκληρο μεροκάματο για ένα μερεμετάκι. Μ’ ένα τεράστιο χαμόγελο λοιπόν, τη διαβεβαιώσαμε πως θα το επισκευάσουμε εμείς. Μάλλον δε μας πίστεψε, αλλά όταν την ίδια κιόλας μέρα προμηθευτήκαμε τα απαραίτητα υλικά και καταπιαστήκαμε με το μερεμέτι, έμεινε να κοιτά άναυδη και ίσως ελαφρώς απογοητευμένη αφού η δουλειά έγινε, το σκαλάκι επισκευάστηκε (και ήταν καλύτερο από πριν) και πια δεν υπήρχε καμία δικαιολογία για να μας ζητήσει έξτρα χρήματα! Τέρμα όμως με τις δυσάρεστες εκπλήξεις! Το Σούκρε το λατρέψαμε για όλες τις ευχάριστες εκπλήξεις που ακολούθησαν! Περίπου 10 μέρες περιπλανηθήκαμε στους δρόμους του, φωτογραφίσαμε τον παλμό του και…φάγαμε σχεδόν όλα τα είδη “street food” που θα μπορούσαμε να φάμε! Α, κι αυτή τη φορά χωρίς ούτε μία δηλητηρίαση! Το καλύτερο μέρος για μας ήταν η αγορά. Η δημοτική αγορά της πόλης Σούκρε δε μπορεί να συγκριθεί με άλλη – τουλάχιστον με όσες είδαμε στη Βολιβία! Ήμι-υπαίθρια, καταλαμβάνει το χώρο ενός οικοδομικού τετραγώνου και είναι τέλεια χωρισμένη σε τομείς ανάλογα με τα προϊόντα που πωλούνται. Περάσαμε πολλές ώρες σ’ αυτή την αγορά. Το πρωί ήταν η ιδανική ώρα για φρούτα και λαχανικά ή ίσως ακόμη και για φρέσκο κρέας. Κατά συντριπτική πλειοψηφία βρίσκονταν γυναίκες πίσω από τους πάγκους που, καθώς ήταν ξεκούραστες ακόμη από την ολοήμερη βάρδια, ήταν πρόθυμες να λύσουν όλες μας τις απορίες για τα περίεργα, εξωτικά φρούτα που απλώνονταν μπροστά τους (βέβαια, ο φόβος για τις εύσωμες Βολιβιανές κυρίες με τις μακριές πλεξούδες επιβεβαιώθηκε γι’ ακόμη μια φορά, όταν ο Στέργιος έπεσε θύμα επίθεσης μιας πωλήτριας κρέατος που, νομίζοντας πως θα την φωτογραφίσει, αντί να του πει “όχι”, προτίμησε να του πετάξει υπολείμματα χαλασμένων κρεάτων…Ας πέταγε τουλάχιστον καμιά συκωταριά να την κάνουμε κρασάτη!). Η βόλτα μας στην αγορά όμως, κάθε άλλο παρά φωτογραφική ήταν! Προς το μεσημέρι, κι αφού περνούσαμε απ’ τον τομέα με τα αρτοσκευάσματα για να πάρουμε ψωμί, σειρά είχε ο πρώτος όροφος της αγοράς: “Comida Tradicional” – παραδοσιακή κουζίνα, έγραφε η πινακίδα με το βελάκι που έδειχνε προς τα πάνω. Εκεί, οι γυναίκες μαγείρευαν κάθε μέρα κάποιες σπιτικές, παραδοσιακές βολιβιάνικες συνταγές. Οι μυρωδιές, οι γεύσεις και τα χαμόγελα τους, έκαναν δύσκολη την απόφασή μας ποια να επιλέξουμε! Άλλος ένας παράγοντας που μας έκανε τόσο συχνούς πελάτες στην αγορά, ήταν και οι τιμές: ένα πλήρες γεύμα με σούπα και κυρίως πιάτο μπορεί να κόστιζε έως 2.5ευρώ! Κεφτεδάκια, λουκάνικα (που παραδόξως έμοιαζαν με ελληνικά χωριάτικα), πικάντικα κοκκινιστά κρέατα…όλα στη διάθεσή μας κι επαναλαμβάνω: χωρίς καμία στομαχική παρενέργεια! Η κορύφωση της καθημερινής μας επίσκεψης στην αγορά όμως, ερχόταν μετά το μεσημεριανό γεύμα: Στο ισόγειο, περιμετρικά ενός αιθρίου, βρίσκονταν οι πάγκοι με τους χυμούς και τις φρουτοσαλάτες. Νεότερες ή μεγαλύτερες σε ηλικία γυναίκες σκαρφαλωμένες σε πάγκους αρκετά υπερυψωμένους, πίσω από βουναλάκια φρέσκων φρούτων, έφτιαχναν χυμούς και φρουτοσαλάτες από φρούτα που δεν είχαμε ξαναδοκιμάσει! Φρούτα όπως η “chirimoya”, η “maracuya”, η “carambola” μαζί με τις πιο γνωστές σ’ εμάς παπάγιες και “ταπεινά” καρπούζια, πεπόνια και φράουλες, αποτελούσαν πια καθημερινή διατροφική συνήθεια!